Filling out a survey in Blackboard is very similar to completing a test. You will access surveys within a Content Area, launch them by clicking on the survey titles, fill them out using your computer. You may even be able to view your responses when you finish. The only difference is that surveys are not graded. Only a check mark will appear in the My Grades area after you have submitted a survey. You may already have experience with completing surveys if you have been completing the Feedback Surveys at the end of each section. This section also includes a feedback survey if you would like one more chance to practice using that tool. You can access a survey when it has been deployed by your instructor in a Content Area of the course. When the instructor informs you that a survey is available, and where to find it, enter that area of the course and click on the survey link to launch it. Like an exam, you will click the Begin button to launch the survey. Instructions for completing the survey will be included on the Survey Entry page. Please read the instructions for the survey carefully before you begin. 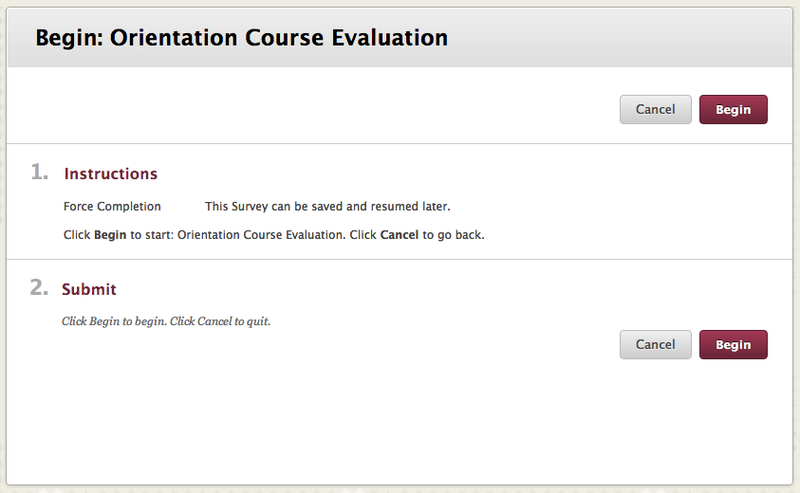 You can identify Surveys by the icon located to the left of their titles in the content area of the course. Some traditional and online courses use Blackboard to deliver their course evaluations. Course evaluations are optional and provide students with an opportunity to anonymously submit feedback about their instructors, the instructional materials, and their overall experiences with the course. Course evaluations are used by departments and their faculty to assess and improve their courses and programs. Course evaluations are usually made available in Blackboard the week before final exams begin. Not all course evaluations are delivered using Blackboard. Every college is different and may have a different process for delivering their evaluations to students. If you do not see an evaluation link for your course in Blackboard, please contact your instructor or the department to verify how you will complete that evaluation.